Of the Kitten Kind: Raw, all natural Chocolate Brownies! Hells Yeah! 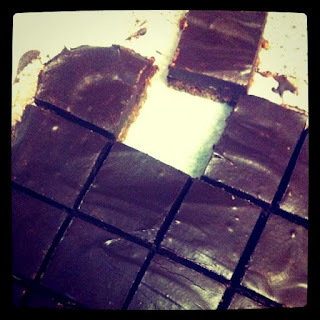 Raw, all natural Chocolate Brownies! Hells Yeah! I gave these to my family yesterday for our Easter celebrations on Good Friday. I must say a massive well done and congratulations to my mum, who is up to week 3 of her 30 day vegan challenge. I'm very proud. She said that she's found it really easy and she's learned a lot about her health and the meat industry. She made a delicious meal with spring rolls and Thai green curry. For dessert we had mochi. Admittedly I am in between night shifts and I fell asleep on the couch but it was delicious. I made these and some raw chocolates to give as gifts. Alas, the chocolates were not hard enough to pull out of the moulds. I have to work on that recipe. I might just chuck them in the freezer and see if that hardens them up. Anyway, these brownies are delicious and super easy to make. I often just use whatever nuts, seeds and dried fruit I have in the cupboard and the chocolate is just superb. It makes you feel a little indulgent even though there is no sugar or artificial crap involved. Yeah! I'll give you a basic recipe but remember that as long as you can make a dough, you can add whatever you want. Time: 10 minutes to make, overnight to set. 2 Cups of walnuts. These are the best nuts to use when making chocolate brownies so try to use at least a cup full of them. They release oils which work super well. 1 Cup of dried apricots. Half a cup of currants. Half a cup of raw cocoa. Half a cup of melted coconut oil. Quarter of a cup of agave nectar or maple syrup. Half a cup of raw cocoa power. For the base, place all of the ingredients into a blender and blend until the ingredients form a dough. Take a square pan about 25cm x 25 cm (ten x ten inches) and line with baking paper. Place the dough in the pan and level out using your hands. Take the ingredients for the chocolate and place them in a bowl. Stir well. You may even want to use a hand blender if you have any lumpy bits. Take the chocolate mixture and place on top of the base. Smooth using the back of a spoon. Place in the fridge to set over night. And that is it! Too easy. You can cut it up and serve it to your loved ones. I often leave a batch in the fridge to put in my lunch box for work. Happy Easter everyone. Have a safe holiday and please take care on the roads. I don't want to see you at my work. Oh, and hello to Christina A. 's friend that has been living in Antarctica. :) You (and everyone else in Adelaide) should come to one of our Cake Liberation Front meetings. You can find the details here.